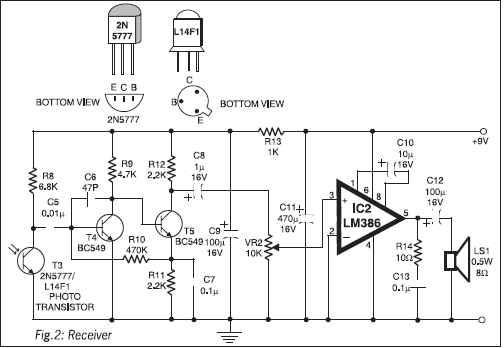 Using this circuit you can communicate with your neighbours wirelessly. Instead of RF signals, light from a laser torch is used as the carrier in the circuit. The laser torch can transmit light up to a distance of about 500 meters. The phototransistor of the receiver must be accurately oriented towards the laser beam from the torch. If there is any obstruction in the path of the laser beam, no sound will be heard from the receiver. The transmitter circuit (Fig. 1) comprises condenser microphone transistor amplifier BC548 (T1) followed by an op-amp stage built around μA741 (IC1). The gain of the op-amp can be controlled with the help of 1-mega-ohm potmeter VR1. The AF output from IC1 is coupled to the base of transistor BD139 (T2), which, in turn, modulates the laser beam. The transmitter uses 9V power supply. However, the 3-volt laser torch (after removal of its battery) can be directly connected to the circuit—with the body of the torch connected to the emitter of BD139 and the spring-loaded lead protruding from inside the torch to circuit ground. The receiver circuit (Fig. 2) uses an npn phototransistor as the light sensor that is followed by a two-stage transistor pre amplifier and LM386-based audio power amplifier. The receiver does not need any complicated alignment. Just keep the phototransistor oriented towards the remote transmitter’s laser point and adjust the volume control for a clear sound. To avoid 50Hz hum noise in the speaker, keep the phototransistor away from AC light sources such as bulbs. The reflected sunlight, however, does not cause any problem. But the sensor should not directly face the sun.